Can the Islanders ride red-hot Tavares and Greiss past another Florida team? Can the Bolts keep excelling without Stamkos and Hedman? SERIES STARTS: Wednesday, 7 p.m. ET, in Tampa Bay. THE LIGHTNING WIN IF… It’s a testament to the Lightning’s depth of roster talent that, without their best player Steven Stamkos and their second-best defenseman Anton Stralman, they still shoved aside the Detroit Red Wings in five games in Round 1. Tampa reached the Stanley Cup final a year ago for a reason. If it was a one- or two-man team, that wouldn’t have been possible. the best, all season long. Excluding a three-game April sample size, Bishop posted a save percentage no lower than .916 and a goals-against average no higher than 2.37 in any month this regular season. He sparkled with a .951 save percentage against the Red Wings in Round 1. As hot as Thomas Greiss has looked for the New York Islanders in these young playoffs, the Bolts have the goaltending edge. Bishop in his prime trumps a fatigued Roberto Luongo. Also key for the Tampa Bay Lightning: the Triplets are back as powerhouse players, even if they aren’t all sharing a line at the moment. Right winger Nikita Kucherov never left, really, as he was as good wire to wire in 2015-16 as he was last season. It thus wasn’t surprising to see him rip off five goals and eight points in five games versus the Red Wings. Particularly encouraging, however, was center Tyler Johnson’s play. He spent much of this season hobbled and/or underachieving put exploded for seven points in the first round, rediscovering the touch that made him the leading overall playoff scorer last spring. Left winger Ondrej Palat shrugged off an ice-cold start, too. He binged down the stretch with 22 points in his final 22 regular season games. He didn’t set the world on fire in Round 1, but his one goal was a game winner. Can the Bolts continue to click on the power play? They ranked 26th in the regular season at 15.8 percent. Their jump to 17.4 percent in the playoffs isn’t monumental, but coach Jon Cooper had his troops specifically work on their power play between games during the Detroit series and clicked for three conversions in a crucial Game 4 at Joe Louis Arena. The Islanders were an elite penalty-killing team this season and held Florida to 13.3 percent in the first round, so this is a matchup to watch. Victor Hedman is such a dominant defenseman that he can make a major impact on this series without his usual partner, but a Stralman return from a fractured tibia would be another huge shot in the arm for Tampa. The Lightning believe he has a chance to play at some point in Round 2. THE ISLANDERS WIN IF… The one crucial edge the Islanders had over the Florida Panthers in Round 1: a true superstar at the peak of his powers. Aleksander Barkov appears headed for that status, but he’s not quite there yet. John Tavares is. The Panthers had no answer for him in Round 1, when he racked up five goals and nine points in six games. He singlehandedly turned the tide in the series-deciding sixth game, tying it up with 54 seconds left and winning it with another goal in double overtime. As long as Stamkos isn’t suiting up, Tavares offers something Tampa Bay lacks. And as long as Stralman remains sidelined as well, the Isles have an edge in high-end defensive talent. Travis Hamonic, Johnny Boychuk and Nick Leddy form a powerhouse top three, each capable of eating major minutes. Calvin de Haan, a tenacious shot blocker, is no slouch either. 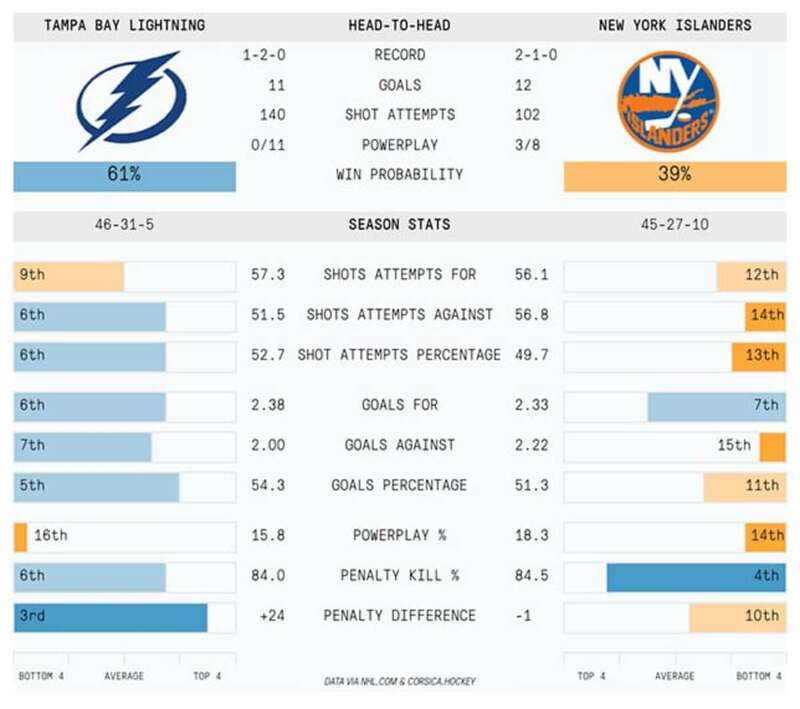 Tampa Bay won’t be able to outmuscle the Isles. Few if any teams can. Their blueline is physical, and they have some of the best checking forwards in the sport. Coach Jack Capuano rolls a true four lines, icing an elite No. 4 trio in Casey Cizikas, Cal Clutterbuck and Matt Martin, who bludgeon opponents to death on the forecheck. The Isles averaged 43 hits per game in Round 1, more than every team except the Los Angeles Kings and New York Rangers. Tampa averaged 29. And, hey, if Greiss can continue his outstanding play, maybe he can neutralize the Bishop factor. Greiss posted a .944 SP against the Panthers and was as responsible as Tavares was for the series victory. Including the post-season, Greiss has already exceeded his career high for appearances by 22 games, so there’s no telling if the workload will start to weigh him down. It hasn’t so far, however. LIGHTNING: Jonathan Drouin, easily. Whether you agreed with this trade request and eventual decision to sit out at AHL Syracuse or not, the one thing no one can deny is Drouin’s offensive productivity on a per-game basis whenever he’s given a shot. Stamkos’ injury forced Coooper to play Drouin in the top six, and Drouin was a vital contributor against Detroit, contributing four assists in five games. He’s essentially been a point-per-game player since rejoining Syracuse and earning a late-season recall to the NHL. When he’s clicking, his speed, hands and creativity make him extremely tough to defend against. ISLANDERS: Power forward Kyle Okposo has a ton to play for. He’ll be one of the most sought after unrestricted free agents this off-season, as he’s just 28 and still in his prime. A powerhouse playoff effort could boost his value, and he was up to the task in Round 1 with six points in six games. It feels like he’s a man on a mission. Expect another standout effort in Round 2. Dom Luszczyszyn Back in 2009, these two teams were in a similar place: the league’s basement. That’s how they ended up with franchise cornerstones in Tavares and Hedman. A lot has changed for both teams since then, and now the two will face off in the second round of this year’s playoffs. 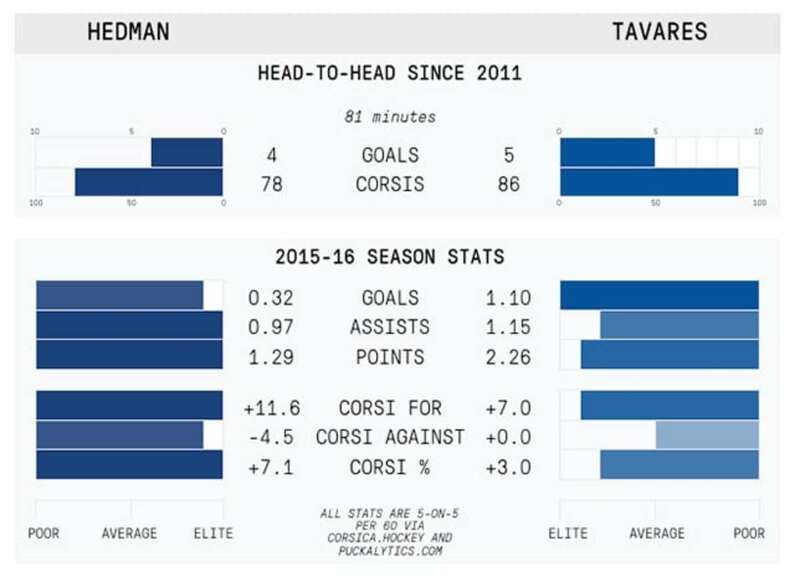 Give the edge to Tavares for the previous head-to-head matchups; he’s got Hedman beat in scoring and possession, although the margins are razor thin. This season, both players were elite at 5-on-5, which is par for the course for their careers so far. Hedman is everything he was projected to be – a hunkering two-way shutdown guy who can create offense. The full package. Ditto for Tavares, an elite center who can change the game in an instance (see Game 6 vs. the Panthers for reference). Both players have pretty much lived up to their pre-draft hype, and now we’ll see which one can take their teams to the next level. THN’S PICK: LIGHTNING in six games.